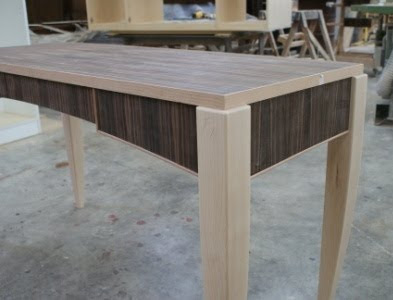 With the drawing and finish sample now approved it is time to proceed with the actual making of this custom desk. 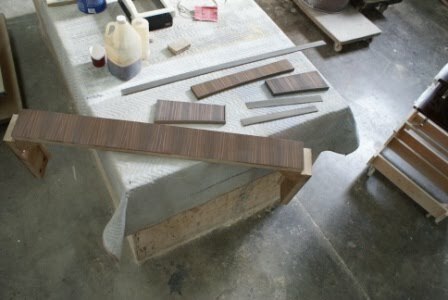 First the Macassar Ebony veneer is carefully cut and bookmatched, before being laminated to rigid veneer core Birch plywood panels. 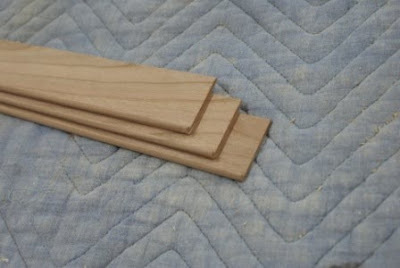 The aprons are double laminated for strength, and solid corner blocks are added to receive the legs. 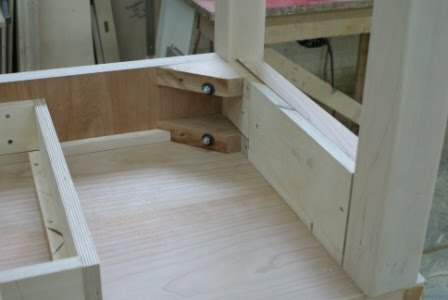 The front legs (alongside where the drawers will be) are going to be mechanically secured with steel hangar bolts. 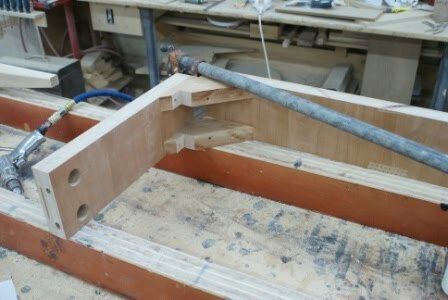 Pipe clamps hold the framework square while the glue sets up. The desk legs are milled out of solid 12/4 Maple stock. These solid cherry bead details will be added later to the underside of aprons and drawer fronts. This view shows the pocket that will receive the dovetailed drawer boxes. 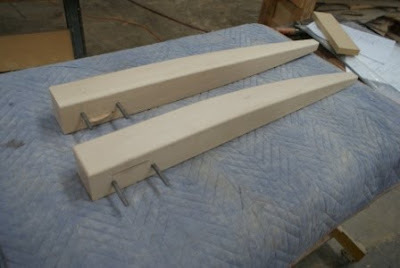 The legs are also bolted in place. The Macassar Ebony apron showing leg and beading detail. With the woodworking portion nearly complete the desk is stood upright to verify proportions, fine tune the details and ensure stability. 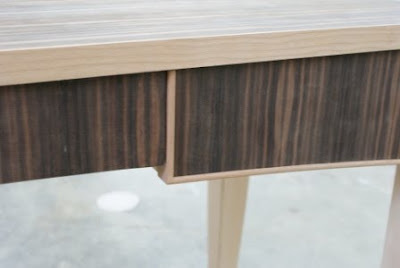 Front corner detail showing drawer closed. 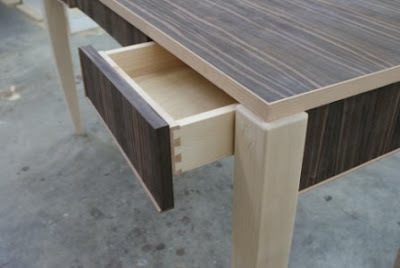 At the intersection where drawers meet centre apron the beading detail helps accentuate the lines. 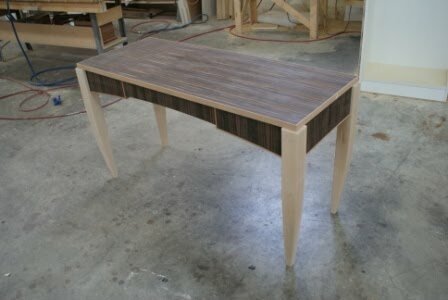 The desk is now disassembled and ready for sanding and finishing. 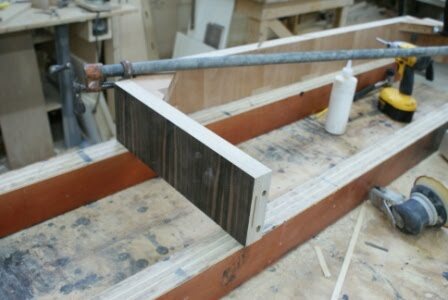 At this stage a traditional vinegar and iron solution is applied to the solid cherry to naturally darken the wood. 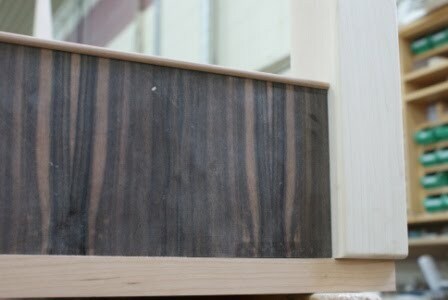 This solution reacts with the natural tannins of the wood to achieve the ebonizing effect.